The building where Hopkins Brewing Co. resides still has the marks of its history. An exposed brick wall with a worn Granite Furniture mural serves as the backbone of the dining area, while the iconic, revolving, neon sputnik sign is perched directly in front of the door in downtown Sugar House, right on 2100 South. While this particular space has gone through many different incarnations over the years (Granite Furniture, an Italian restaurant, The Annex and even an old bank in the 1800s), with Chad Hopkins at the helm, Hopkins Brewing has taken over since the end of 2018, creating a brewpub with a laid-back atmosphere and an eclectic, mouthwatering menu that is sure to become a fixture in the Sugar House area. Epic Brewery still owns the property from the days of The Annex. They have essentially put Hopkins, an experienced home brewer, chef and restaurant manager, in charge of making the most out of the space. Specifically, the shiny, chrome brewing system that greets customers the moment they walk in was in need of TLC and use. “I didn’t even know there was a brewery in here until they asked if I wanted to take over this property,” says Hopkins, who explains that for the past couple of years, a wall was used to separate the brewery system from the rest of the space. 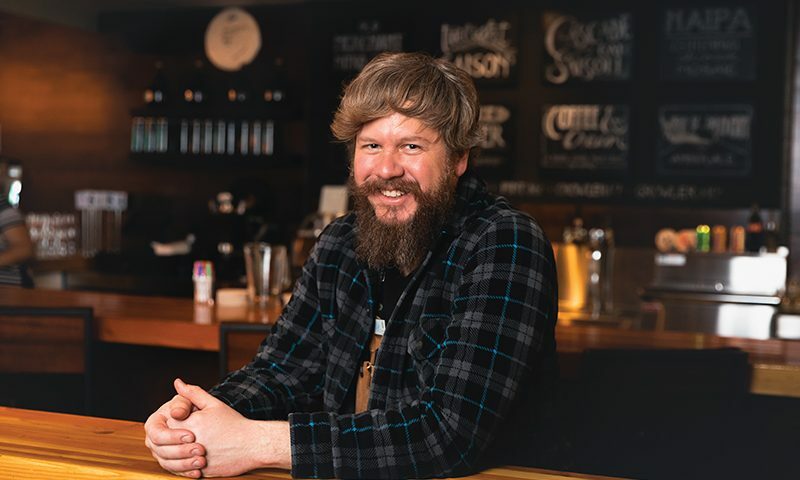 Hopkins and his team took down the wall, cleaned and updated the brewing system, and made it one of the focal points of the Hopkins Brewing experience. Open for four months, Hopkins Brewing already boasts eight beers on tap. For Hopkins, by far the most popular is the NAIPA (Not An IPA). “Everyone wants an IPA these days,” he says. “The whole Session IPA thing happened, and I just don’t believe that’s a real beer style. It’s basically just a pale ale. So I just did a hoppy pale ale and called it Not An IPA.” Hopkins continues to poke fun at different styles with his newest brew on tap, the Hipster AF, a triple-dry-hopped “Milkshake” IPA. As far as favorites go, Hopkins is particularly fond of the Coffee and Cream Milk Stout. “It’s a stout with a little bit of milk sugar in it,” he says. “You get the boldness of the coffee, the roasted and sweet backbone to it. That one is probably my favorite beer to drink.” With the extensive homebrewing experience in his pocket and the willingness to delve into some strange territory, Hopkins Brewing hopes to establish a legacy in Utah of pushing the envelope for craft brews. 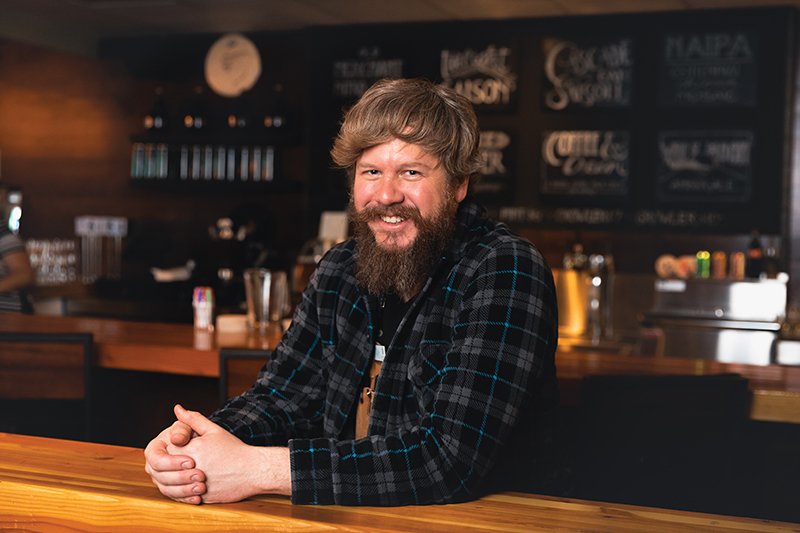 Technically part of the Epic Brewing extended family, Hopkins sees the local, up-and-coming craft beer community as supportive rather than competitive. “Craft beer is awesome, such a good community. We all like to drink each other’s beers. It’s more [competition] against the macro brewers,” says Hopkins. While the complexities of Utah law go back and forth between favoring and hurting craft brewers like Hopkins, he remains optimistic about eventually offering a higher alcohol level than 4 percent. “A lot of the beers I made at home were a lot higher than that. There’s so many flavor profiles, but it’s hard to hit them without the alcohol backbone,” he says.